Home / Non classé / Open Data: show me the money! Open Data: show me the money! Four years after the first moves toward opening public data in France, the economic question remains the same – why do we always have so much difficulty determining the economic impact of open data other than in a McKinsey-like style, in billions of dollars? Where is the start-up that will revolutionize the world and that owes everything to open data? This article is an excerpt of the book Open models published in French in 2014 and translated in 2016. The debate on value is not new, and open data value measurements are formed using one of two ways of thinking. Either it is the value of the market for public information that is measured (for example in the context of the 2006 MEPSIR study), while a number of them were not open; or on the other hand, it is the opportunity gains that are accounted for (McKinsey Global Institute). According to this second way of thinking, many reports were prepared and they all reach conclusions of huge amounts. The most recent, prepared by McKinsey in 2013, places the annual value of open data between 3,220 and 5,290 billions of dollars. To put this into perspective, the GDP of Germany, 4th country in the world, sits at 3,747 billion in 2014. At the same time, many governments put in place policies to open public data for political (more open governance) and economic (to enable development of new activities that will generate economic benefits for the country or society) reasons or to drive modernization of public action. However, it has to be said that there are currently few available convincing examples of economic value generated by open public data. Where is the start-up that owes everything to open data? Similarly, companies don’t fully commit to the opening of data that they possess, generate or manipulate, with the exception of a few players in the transport and mobility sector. What reasons explain the difficulty in measuring the economic impact and value of open data? The delayed effect is a first hypothesis that we can put forward to explain our difficulty in measuring economic impact. This is an approach that was developed in particular in the 2012 study undertaken by Marc de Vries and Geoff Sawyer for the European Space Agency. The authors distinguish 3 phases in the data opening effect – a sowing phase, a growing phase and a harvesting phase. If we use this approach, it is therefore logical that we do not yet see the economic benefits because we haven’t yet entered the harvest phase. In assessing the value of open data, there is a key element which is often not highlighted by authors and commentators, and which partly explains the difficulty in seeing the fulfilment of promises made. This is the fact that in many assessments, (and in many cases of open data use), the value of the open data is realized in a large part in combination with other data, which are not necessarily open, what we generally call big data. We sometimes have trouble understanding whether opening creates value for data…or whether it destroys it oil disappears with use, whereas data can be used indef initely. Unlike gold, data does not have a hoarding value. According to this hypothesis, in order for the value of open data to be revealed, the availability and use of other data is a determining factor. It is not only the availability that produces the whole value. This final hypothesis is that reuses of open public data are not always visible, communicated or explicit. Some reuses are particularly visible when they are embodied in mobile applications which employ them. On the other hand, the majority of open public data reuses are not communicated outside the organization that uses them. Thus it is difficult to measure that which we are unable to see. Efforts are being made however, to better identify and record these uses, for example, the site Open Data 500, which lists them; and the open public data platform data.gouv.fr, which enables users to put reuses that they have undertaken with available data online. Datanomics forward thinking: what does opening do to the value of data? To try and look more clearly at the question of the value of open data, let’s take a detour via the value of data. Within the Datanomics framework, we identified three different types of data value – data as a raw material, data as leverage and data as a strategic asset. Let’s concentrate on data as a raw material. The common metaphors used to describe data value (oil, diamond, wheat or gold) surface very quickly in this concept. We see data as a fuel that feeds a machine (oil), as a material that gains value once it is processed (diamond) or as a product that can be consumed or used to replenish (wheat). There are many limits to these comparisons. Oil disappears with use, whereas data can be used indefinitely. Unlike gold, data does not have a hoarding value. One observation must be made. With open data (which by definition, do not monetize transfer), the monetary value, that which is associated with the data as a raw material, is in large part close to zero. This is also one of the conclusions of the Trojette report on public data usage fees, published in 2013. Another reason which explains the close to zero value of data with opening can be found in the revolution of proxies. As there are many sources available to measure the same phenomenon and that a large majority of them are accessible for free, the scarcity and exclusivity of the data are much less guaranteed, their monetary value tends to decrease. This explanation is supported by another observation relating to open data players and their business model. When open data initiatives started, economic players appeared with an “infomediary” positioning or an open data market position (Infochimps and Data Publica, for example). Today, these players have abandoned this purely intermediary positioning (data broker) to move toward a service type positioning. It is not the data that are sold, but the services that enable them to be exploited (visualization analysis for example). Data as leverage value type corresponds the most to the value of open data. It enables organizations which use open data to improve their performance, either by avoiding costs or by growing income through better rates or new sales. The nature of open data value is that of data in general: value is found in reuse, it is in the future and co-constructed. In reuse, as it is not directly monetized. In the future, as the value is only revealed once the use has occurred (it is in theory difficult to assess). Co-constructed, as it is rare that the person in possession of the data can reveal the full value. In fine, opening of data presents a great number of challenges to private players. Should we accept that the monetary value of the data is close to zero, that is, do we refuse to sell them in order to better exploit the strategic value and leverage effect? As a manager of a large group who is heavily involved in open data approaches told us, “As long as no-one is making money with our data, it’s not a problem for us to open it”. Simon Chignard is Etalab Data Editor in charge of public open data platform data.gouv.fr. Data specialist, he previously worked with private and public organizations to define open and data-driven strategies. 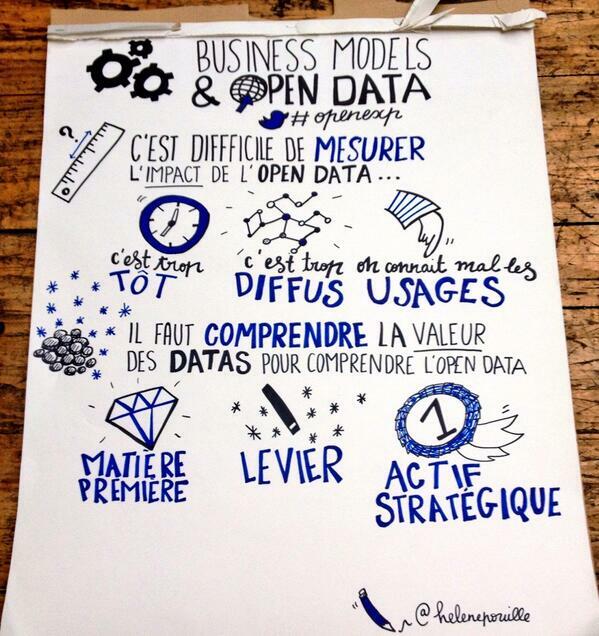 He wrote “Open Data, comprendre l’ouverture des données publiques” (Fyp Editions, 2012) and “Datanomics, les nouveaux business models des données” with Louis-David Benyayer (Fyp Editions, 2015).